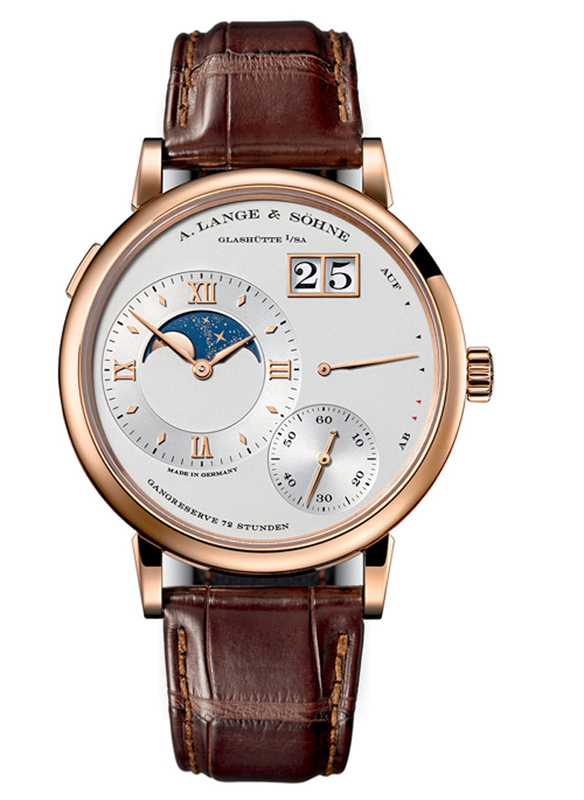 A. Lange & Sohne’s Grand Lange 1 Moon Phase is designed to remain accurate for 122.6 years. Just about a month ago, A. Lange & Sohne invited journalists from around the world to the unveiling of its Grand Lange 1 Moon Phase watch that tracks the lunar cycles in — well – grand style. The official unveiling of this watch to the world will occur in just about two weeks at the SIHH in Geneva, but we wanted to give you a look at it here before the show because it is simply, or not so simply, beautiful. The new Grand Lange 1 Moon Phase, which, by the way, is designed to remain accurate for 122.6 years, is prominently displayed on the left side of the dial and the nocturnal sky is remarkably alluring thanks to a patented coating process for the solid gold lunar disc. A laser is used to cut out more than 300 stars of different sizes with extremely sharp contours, producing a miniaturized image of the galaxy. 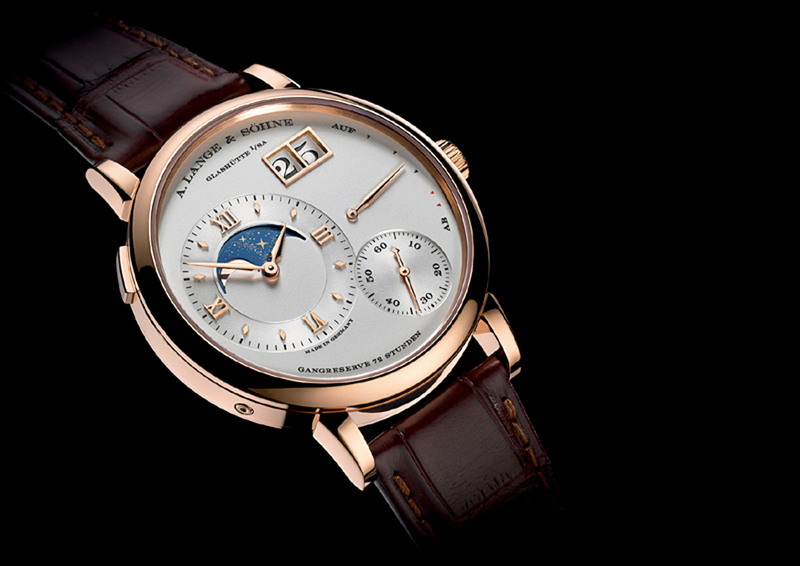 The Grand Lange 1 Moonphase houses a manufacture caliber L095.3, with 72 hours of power reserve. Prior to the unveiling of this timepiece, Lange has created a dozen different moonphase displays, but this one is visually and technically advanced. The display, connected with the hour-wheel, is constantly in motion – much like the moon – though the movement is barely visible to the eye. Thus, the display also indicates the time that elapses from new moon to new moon with an accuracy of almost 100 percent (99.9978%). The average month lasts 29 days, 12 hours, 44 minutes and 3 seconds. Most moonphases round this month to 29.5 days – which translates to a deviation of 44 minutes and 3 seconds per lunar cycle – or one day every 2-1/2 years. Lange’s seven-gear transmission reduces the deviation per cycle to less than one minute so that once it is correctly set, and assuming that the watch runs continuously, the display would only have to be corrected by one day every 122.6 years. 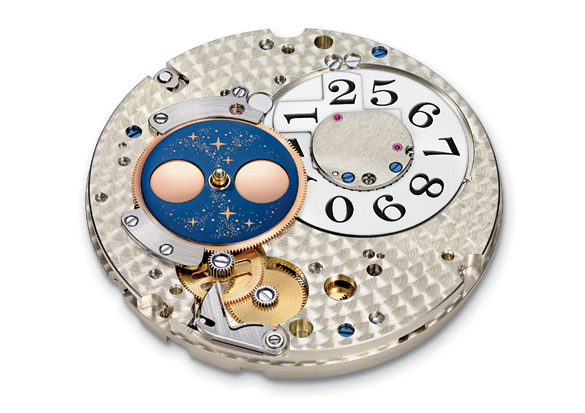 The Grand Lange 1 Moonphase feaures a patented coating on the moonphase indicator. Meaning – sorry for this – that you don’t have to worry about it in your lifetime. Naturally, just in case the watch has been allowed to stop, the display can be adjusted via a pushpiece. The watch houses the Lange manufacture caliber L095.3, with 72 hours of power reserve, a balance spring developed and manufactured in-house, a three-quarter plate made of untreated German silver, and Lange’s renowned hand finishing. The pink and yellow gold versions will be approximately $53,000 while the platinum beauty will sell for about $65,000.